Fate Grand Order how to reroll, best characters to get, reroll tier list. 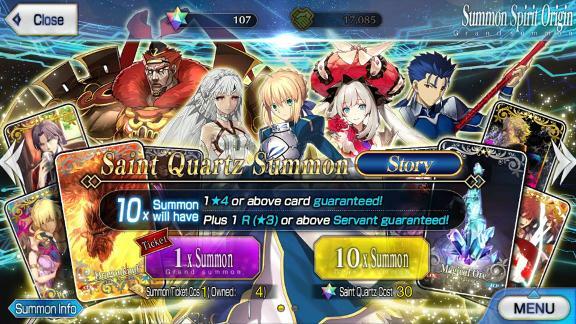 Rerolling is a way to get a servant you want by trying the first/second summoning during the tutorial. Then you can start the game with best servants. At least one of starter ★4 servants is guaranteed during the first Saint Quartz Summoning in the tutorial. ★5 Servants cannot be summoned during the tutorial summon. If you aim to get a ★5, you'll have to do the Saint Quartz summon after the tutorial. ★5 Servant drop rate is 1.0%. 1 reroll will take around 15 minutes. Since ★5 servants are not available the following extra steps for an additional summoning is required. FGO doesn't require high-tier servants to clear high level content. There will also be many more chances for you to summon more servants. However, if you wish to get a specific servant you like or wish to have an easier time with the game, then you should reroll. 10 Heracles can carry you very far into the game just by himself, his high attack stat combined with being of the Berserker class and skills which increases his attack and crit allows him to deal large of damage. To add to this he has high survivability with Mind’s Eye (False) which grants a turn of Evade and Battle Continuation, which gives him Guts for 5 turns. This is all without mentioning his bond CE. He is highly recommended as a reroll pick. 9.5 Tamamo has a somewhat unique Noble Phantasm which deals a large amount of damage but also heals her. However, she gets stunned for two turns afterwards, which is a major demerit as she could cannot build more NP or do damage and clogs your hand with unusable cards for two turns. As a Berserker with a BBBAQ deck, it is hard for her to build up her NP gauge without the assistance of outside sources, but allows her to dish it out in the form of Buster chains instead. Overall a servicable roll, but she will be outclassed by other servants. 9.5 A pick for the long run, he can fill his Noble Phantasm gauge decently and has a place on Arts Crit-based teams with his star generation. His Noble Phantasm ignores defense, but is a little weak until you complete his interlude quest. He also receives a damage boost in many future events. One of the better servants to pick. 9.0 Carmilla is quite lackluster, her Noble Phantasm isn’t that powerful in addition to being a Buster Type which doesn’t mesh well with her deck. Her skills leave a lot to be desired. Only Vampirism really being useful to build her NP which as stated above isn’t that good. Not recommended as a reroll pick. 8.0 Elisabeth excels as a support servant, with Charisma: a party wide attack up which is improved through her strengthening quest (improvement grants more attack up for female servants). She also has Torture Technique, which reduces the enemy’s defense. Her Noble Phantasm ignores the enemy's defense which allows her to deal a decent amount of damage. However, due to her skills she truly shines as a support. A future-proof pick. 8.0 A debuffing NP may make d’Eon seem valuable at first glance, but his NP debuffs only a small amount. He/She has an incredible taunt skill, but that alone doesn’t grant him/her much use in battles. While he/she could be useful, not recommended as a reroll pick. 7.5 Marie is a servant with a skillset which is quite unique when compared to other Riders, which allows her to excel at absorbing damage. She does well in teams which intend to stall, with her ability to become invincible and heal. Even though her attack leans a little on the low end, she can do well throughout the early to mid game. While later on she is outshined by others, she is still a good pick. 7.5 With two self-heals, she can do well in the early game, helping you clear some content. She also has three Arts cards, allowing her to build her NP at a decent pace and her NP does modest damage along with granting a defense decrease. A decent starter, but not useful in the later game. 6.5 Stheno has an amazing anti-male kit, and would work well with other servants of a similar design, allowing the player to essential cripple male bosses. Her major drawback is her NP does not damage, but inflicts an instant kill effect instead, later game bosses will have high death resist which makes her much less useful. While Stheno has her niche uses, she is not recommended as a pick. If you really need to get a 5★ servant by rerolling, Zhuge Liang or Jeanne d'Arc will be the first ★5 servant to aim to get. They are top servants still in JP version due to their very versatile skills/NPs. Note that you can't pull a 5★ servant from the first Gacha you roll during the tutorial. 10 If you're in the NA Server, Zhuge Liang is the best Support Servant you can afford as his skills can cater through the needs of the party's offense or defense or critical power AND NP gauge in the same time, while his NP is a mass debuff that can facilitate your party's damage output while also having a chance to stun an enemy and definitely delaying a strong NP. All this comes with the package of naturally being able to charge up his NP quick with a QAAAB deck. 10 Jeanne's role to tank will serve early players well, as being a Ruler class, she's resistant to almost everything thrown at her and her stats are high enough that even without class advantages, she can still deal constant damages. She can also take care of your whole party's protection with her NP, the stun demerit will soon be lifted away with further Interlude, so it's adding up to why she's a recommended Servant to look for. Basically, you don't finish rerolling even if you pull a *5 Craft Essence, but Kaleidoscopeis exceptional. Equipping the CE, a servant begins a battle with NP charged at 80%. For other useful Craft Essences, check the link below. Not sure how often this gets updated but I just tried this and it didn't work. I prefer to reroll. My luck is E rank in nature. Whenever I do not reroll, I always get units like Siegfried, or ones of equivalent uselessness in other games. 1) I managed to pull Vlad in the tutorial summon. 2) Tamamo cat only is stunned for one turn after NP. 1. It's been confirmed that you won't be able to get any 5* servants from the tutorial summon. 2. Tamamo cat will stunned herself for two turns according to both wikipedia and cirnopedia. The first turn of her stun will simply void any later cards of hers in that turn, the second turn is the only one that will clog your hand.